“What makes a school a place where teachers want to work?” We posed this question to our faculty three years ago. The feedback we received was the catalyst for changes that would improve our school culture. To be completely transparent, the school I serve in has a history of success and good culture, so the changes we’ve made are not worthy of a complete “school turnaround” story. However, I do think they moved the needle into greatness. What we did next, I feel, was the most successful decision. We shared these categories, with all the feedback classified under them, with the faculty. We divided them into groups and asked them to help us develop solutions. Essentially, instead of a group of administrators sitting in a room and stressing over how “to fix” all these things, we asked the faculty to help us make improvements for the school. We took a risk and asked them to take ownership of the improvements. The results were outstanding! Each group of teachers came up with a list of practical solutions to improve the school in all categories. They asked to classify committees, define their purpose, and improve the way they communicate their work to the rest of the school. They asked for improved communication of meetings, agendas, and professional development. They asked to be included in more building decisions and came up with ideas to ensure this happened. They suggested ways to increase support for our fast-growing population of students with special needs. They asked for more recognition of all staff members. The group’s solutions were specific and realistic. The staff was empowered to take complete ownership and leadership to improve our school. We immediately made some easy, practical changes. We also set the ball in motion to make some changes that would take a lot longer, such as developing new ways to include faculty members in leading professional development sessions (This year over 30% of faculty did so). Each year, we’ve made changes and have continued to survey our teachers, asking the faculty to respond to survey statements and rate each of the areas we categorized. We have found continued improvement in all categories, including staff culture. The tone of the feedback has shifted from focusing on complaints to focusing on ideas and improvements. Each year, we share the results with our faculty. Our teacher leadership team reviews the data and feedback, and generates recommendations to improve our building. This summer a group of teachers is creating a “welcome package” for our new hires, including a school t-shirt, mug, and a new, teacher-created, “Survival Guide.” Our faculty never ceases to amaze me with their leadership and commitment to taking ownership of their school and making it the best place it can be. It’s amazing what results from asking just one question. What questions do you ask? *Thanks to Erin Murphy (@MurphysMusings5) for her input on this post. Be sure to check out her blog: Murphys Musings. “That person must work at our school!” That’s what we want to be saying to our interview committee when a teacher candidate walks out of the room. 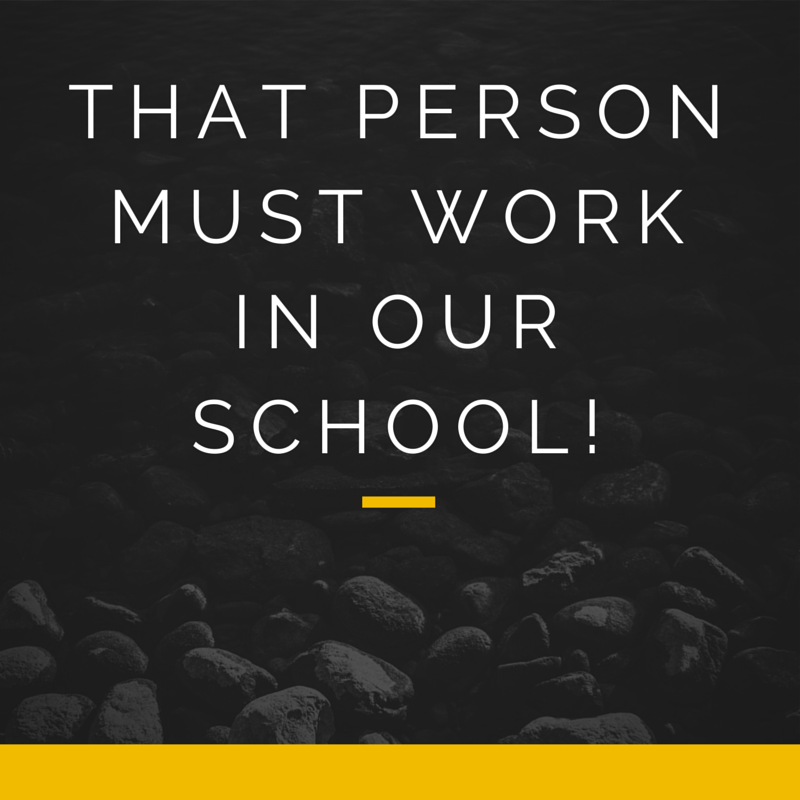 We want to be thinking that our school cannot afford to have that person not working with us. This is the level of excitement we want to have when deciding to hire a new teacher. We want to feel like this person not only fits into our culture, but will bring something we don’t have, will move us forward, and will make us better. It’s interview season! Time to get to work filling positions created by retirees, transfers, or if you’re lucky, additional staffing. Now the downside. All the paper screenings and computer algorithms in the world cannot always find us the best candidates. To me, you need to meet people, speak to them, and get to know them both professionally and personally. I need to learn much more about them then just their credentials (already read their resume), or what their favorite lesson was. I need to know about their attitude, guiding philosophies and what motivates them everyday. This year, we’ve tossed around using some new questions such as “What is your life motto, or words you live by? ; What’s your favorite song? ; What leadership roles do you hope to fill at our school? ; How do you stay current in the field of education? ; How do you prove to your students they are important?” These questions are aimed at trying to get some insight into who the person is and what their attitude and mindset may be. Shawn Blankenship (@Blankenship_S) wrote a post that appeared on Connected Principals back in April, called “Teacher Interview Questions That Work“. The questions Shawn shares not only allow us to get to know about a teacher’s craft, but also allow us to see into their personality, attitude and desire to improve. They help us get a more complete picture of the person in whom we are investing. Positive attitude, motivation, determination, innovative, growth-mindset, sense of humor, sense of caring… These are just some of the very important intangibles I look for in a candidate. What other attributes do you look for, and what creative questions do you use to try to seek them out in a teacher candidate?